I am often asked what I use 3D printer for, and my response is usually… “UM…EVERYTHING!” This is because once you understand how 3D printing works and have access to the technology, you start to see so many different ways in which 3D printing will help solve a problem or make something that’s just really stinking cool. Last year, after we completed our kitchen remodel, I had the seemingly brilliant idea of putting potted herbs on my kitchen window sill. This particular window sill got great light, so I thought the herbs would flourish in this location. 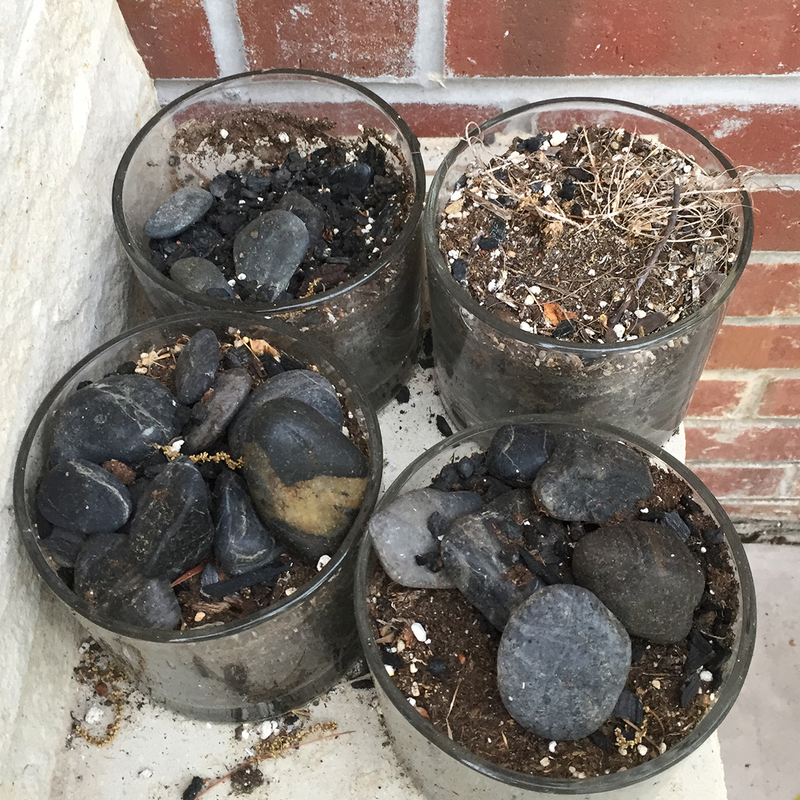 And to make them look modern and elegant – I potted them in some glass containers I bought at Hobby Lobby despite the warnings from my friend who is a much more experienced gardener. The problem? 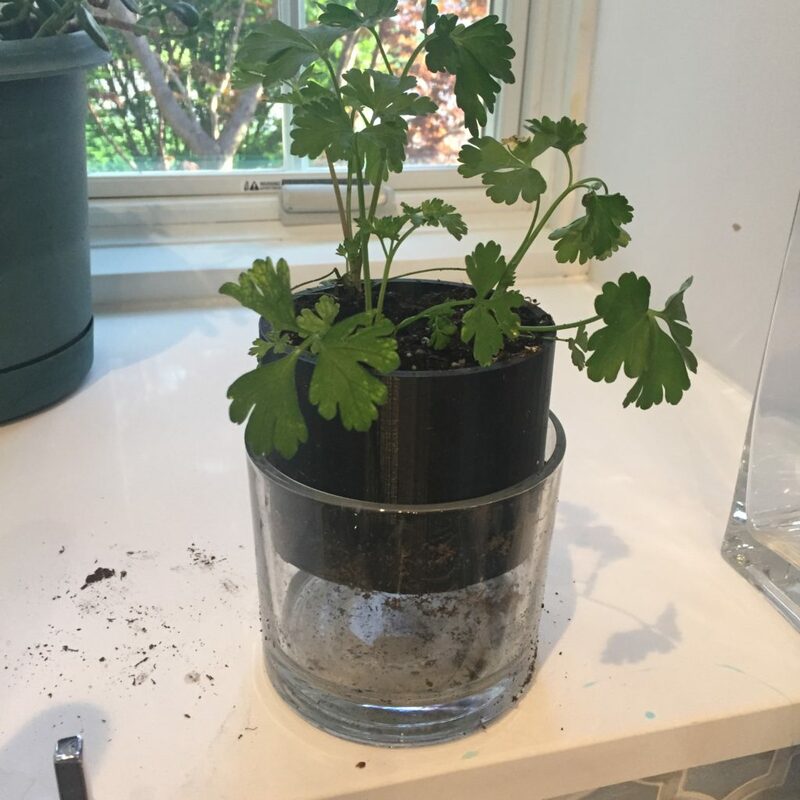 There were no holes in the bottom of the class container, and therefore no way for the plants to drain off excess water. Yet – despite her concerns – I did it anyway. Unfortunately, my friend was right. One by one my herbs slowly died and the glass containers sat on a shelf in my garage filled with the remnants of dead herbs soil and rock. Then I got the idea, what if I were to 3D print a container with drainage holes in the bottom that would sit inside of the glass ones? This would allow the herbs to drain and the water to collect in the bottom of the glass containers. I could then simply remove the 3-D printed pots from the glass containers and dump out any excess water. Brilliant. So I design my pots in TinkerCAD and printed them. And they looked great. The only problem was that they didn’t fit. Unbeknownst to me, these glass containers were bigger in circumference at the top than at the bottom and I designed the pots to be in the shape of a cylinder. Measure twice – print once! Fortunately, TinkerCAD has a shape tool that allows you to model a cylinder with different diameters at the top and bottom which was precisely the shape I needed to make my pot. And – as you can see here – attempt number two worked out pretty well. 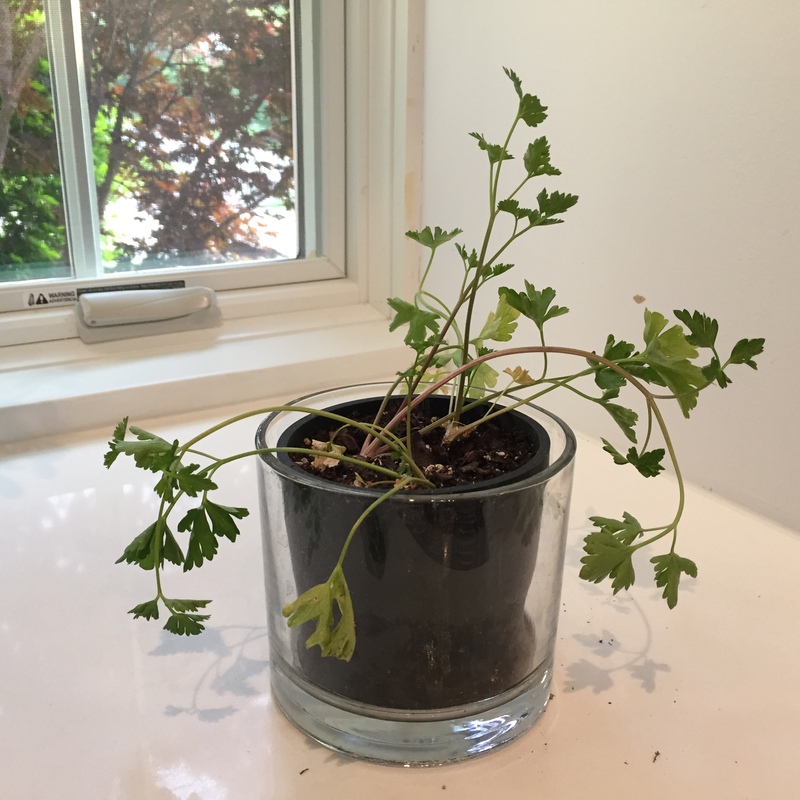 For the time being my parsley is thriving it its new home. (Yes – I know it’s a little saggy as I repotted it 3 times now… ). 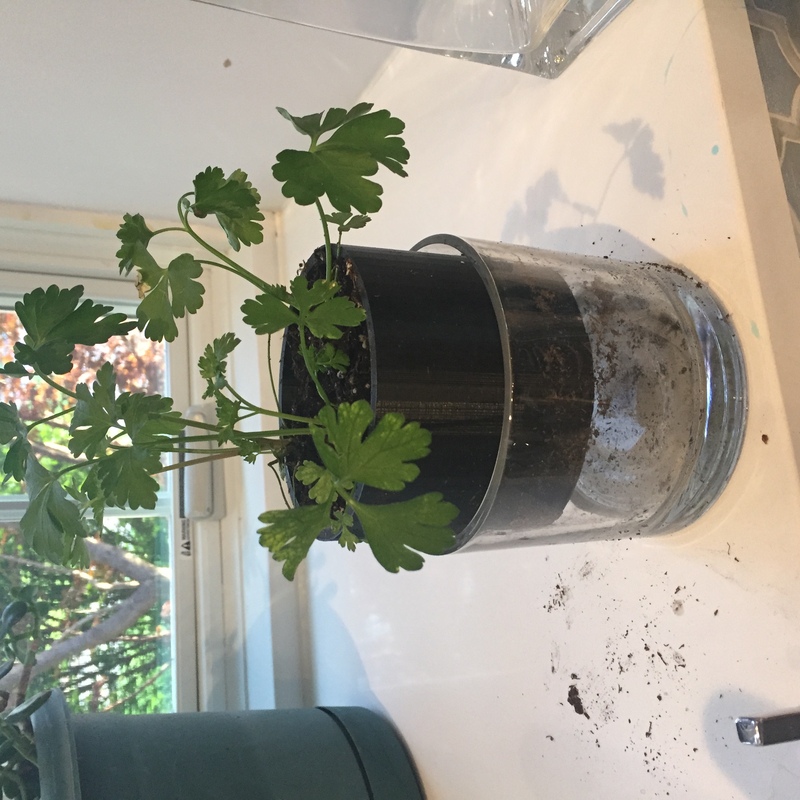 But before I replicate this pot a few more times for my other glass containers, I think I’ll give it a few weeks… I’m not exactly known for my green thumb. ← Previous Previous post: Web site makeover for ESS. Out of the 90s and into 2018!